I say it all the time, but if you can do your practice with an approach of ‘little and often’ you’ll feel and see progression way quicker than if you save it all up for a 90 minute yoga-beasting once a week. With two sessions a day, your body is going to be up for way more negotiating about how short your hamstrings are/how tight your shoulders are/how strong your core is than you’ll get from your one weekly class. How many times have you fallen off the mindfulness wagon? I know it’s only ten minutes every day, but how come it’s suddenly so impossible to find? (Yet 36 minutes looking at cats on Instagram? Not a problem!). 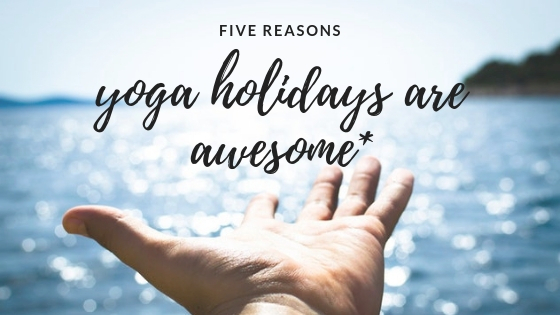 But on a yoga holiday you’ve got no excuses (or at least they’re much harder to find). You’ll have all the support you need, the instructions that will help, and a bunch of people who are also finding it really tricky. Is it just my house where fruit and vegetables come to die? I swear we’re like a hospice for organic produce. We all have the best intentions at home, but when we’ve got a gazillion other things to do it’s always easier to phone for a pizza, put the chips in the oven, or pop out for poppadoms. Even when a yoga holiday has the offer of a bit of booze (as mine will) you know that most of the time you’ll be fuelling yourself with good, healthy fodder. And without having to do the washing up too – result! No; not that questionable bikini. I mean those old habits and unhelpful old patterns which no longer serve you. Stepping out of your ‘normal’ is a great way of holding up a magnifying glass to all those little (or big) things we do which hold us back, prevent us from being awesome, and make us feel more than a bit rubbish. Spotting this stuff is easy – it’s then not doing it that’s hard. But when you’re surrounded by a bunch of people trying to do the same, it might even be fun. Stepping away from all your normal day-to-day stress is always a good thing to do. But stepping into a place that’s calmer, quieter, and totally set-up for soothing your soul, means that you can not only stop getting distracted by all that external stuff, you can really tune in to the still, small voice within that so often gets drowned out. Imagine being in a space where your body can be still, your mind can get quiet and there’s nothing to do, but just ‘be’. Sounds kinda’ brilliant, right? BONUS REASON: They’re awesome BECAUSE THEY ARE! The sum of their parts means that there’s no better way to nurture yourself. You know that the only way you can be your best self is to be your own best friend – so why not take some time to make it all about YOU? Come join me in and the friendliest yoga tribe you could ever meet. We’ll be in Southern Spain this August – AND you can pay 50% now and 50% later…WHOOP.